Parents of Samford University’s newest students now have a unique way to show their support for the school and the loved ones that they are entrusting to its care. A new Parent Prayer Guide and accompanying Prayer Walk Map will assist parents and others in praying intentionally and specifically for the people and programs that make up the university. “Our hope is that it will be a tool that friends of the university can use to pray for the university effectively, and beyond the obvious,” said Samford director of parent programs Susan Doyle, who helped develop the materials. The prayer guide lists 31 suggested prayer topics, one for each day of a month. The prayer requests run the gamut from trustees, faculty and staff to specific student programs, campus facilities and academic areas. The guide can be viewed on the Samford parent programs web page. The prayer walk map provides a suggested route with stops for intercessors to pray for specific campus sites and the people and activities associated with each place. The route starts at the Ralph Waldo Beeson statue, with suggested prayer requests for the university as a whole and its administration, and includes 12 other stops before ending back at Samford Hall. Parents at each orientation session this summer will be invited to participate in a 6:30 a.m. walk on the second day of their stay. Four freshman orientation sessions are planned during June, with another in August. Samford expects about 800 new students this fall. The walking route is planned to take about an hour, said Doyle. The farthermost prayer point is near Andrew Gerow Hodges Chapel, which invites prayers for global mission programs and diversity. From there, a view of the athletics fields encourages prayers for protection of athletes’ travel, preparation and participation. “We wanted people to have a sense of the campus life in relationship to the buildings or an area,” said Doyle, adding that the route is an easy walk without a lot of steps. An appropriate scripture passage is listed with each stop. At Chapman Hall, for instance, which houses university ministers and spiritual life offices, Jeremiah 17:8---which references a tree sending out roots and always bearing fruit even in a year of drought---is the suggested passage. The scriptures were chosen by Samford parent Lori Fridy, who Doyle credits with the initial idea for the new prayer effort. Fridy and her husband, Rick, serve on the university’s Parent Leadership Council, and she heads the council’s Faith and Prayer work group. The New Port Richey, Florida, couple are parents of a rising junior, Rich, and an incoming freshman, Alexandra. Fridy says she has prayed for her children and their school since they started preschool through Moms in Prayer International, which promotes moms praying over their children and the school they attend. After she discussed a proposed Samford parent prayer effort with Doyle, they both agreed that it fit perfectly with the school’s faith-based mission. “I researched and found that very few Christian colleges had a parent prayer effort,” said Friday, who prayerfully used ideas from several sources to work with Doyle and assistant dean for spiritual life Matt Kerlin on the project. “As I talked with Susan and she described the areas of campus included in the walk, we collaborated on how to make this an experiential walk using the senses to engage the prayer intercessor,” Fridy explained. 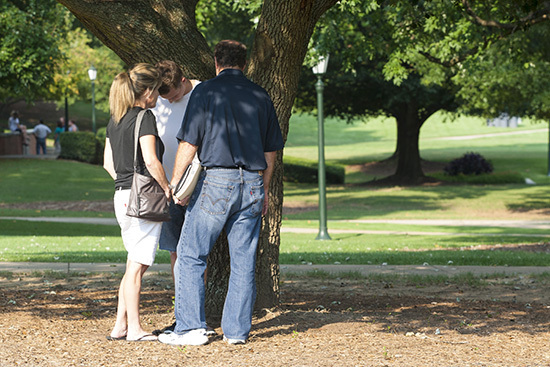 “Because God says His Word never returns void, I knew we needed to include prayers that stood on and claimed scripture over Samford’s staff, students, families and grounds. I am very excited at the thought of hundreds, if not thousands, of intercessors praying over this school,” she said. The united prayer effort falls in line with Doyle’s desire to find new ways to “appropriately and meaningfully” engage parents in the life of the university. “There are parents who long to be more deeply connected to the university beyond writing a check,” said Doyle, a Samford graduate. She and her husband, Sean, also a graduate, are parents of a rising senior, Bailey.